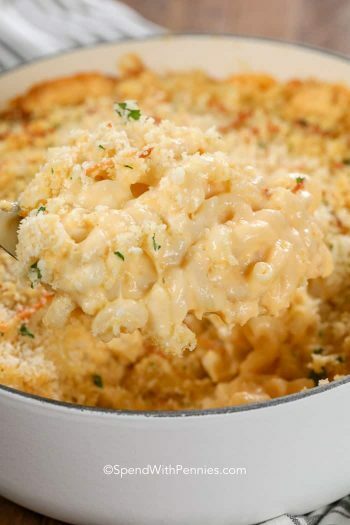 This homemade Mac and Cheese Casserole is the best you've ever had. Tender noodles in a velvety sauce for the perfectly irresistible dish!! Melt butter over medium heat in a large saucepan. Whisk in flour and let cook 2 minutes while stirring. Slowly whisk in cream, milk, mustard powder onion powder, salt and pepper to taste. Cook over medium heat while stirring until thickened. This is really outstanding! I didn’t have any mustard powder so I just used a little bit of yellow mustard instead. What a fantastic delicious taste ! It’s one of my favorites too Dana! So glad you loved it! OMGosh! So very creamy, cheesy, and delish! I didn’t have the soup, so I used 10oz of homemade nacho cheese with jalapenos, and a splash of extra 1/2 & 1/2 to thin it a little. I’ve tried a million mac and cheese recipes, but this was the best BY FAR! I am so glad you liked this ma and cheese casserole recipe Erin! Homemade nacho cheese sounds like such a great spin on this dish! I had a recipe that called for 1 1/2 cups of shredded guyuere cheese, 1 1/2 c of shredded Monterey cheese, 1 cup shredded sharp cheddar, and 1/4 cup shredded parmesan used for the top. Then I prepared the recipe, it tasted very lumpy from one of the cheeses. How can I tell which one? Can you used the parmesan cheese like you sprinkle on spaghetti in place of shredded? Thank you for your help! Did you shred your cheeses or buy pre-shredded? Pre-shredded can sometimes have additives and starches to keep them from sticking together in the bag which can interfere with how they melt. I am planning to make this recipe tomorrow and I want to use the cream of cheddar soup, but I cannot find it at any of my local stores. I was wondering if Campbells Cheddar Cheese Soup is the same thing? Thank you! Yes, this is the same. Enjoy Taneka! Absolutely amazing!!! Love this recipe and will make again and again! Happy to hear that Taneka! Searched several recipes for a creamy mac & cheese. This turned out the best so far. I did not use the soup but will on my next go around. Can’t wait to try it! The family loved it! So good! We modified it a little bit to fit our guests. We made half with green chiles added (New Mexicans and their green chiles, sheesh), and the grown ups loved it. Also, instead of bread crumbs I used crush up cheezits, a trick my old boss taught me, and it added just a little something extra special. Great recipe! LOL… I’m a huge fan of green chiles, I’ll definitely have to try it. Love your topping idea, thank you for sharing! Hey thanks for posting this – the only comment I would make is – when i make a recipe for the first time, I follow the directions carefully . . . and there’s no point where it tells you to add the salt and pepper so mine seemed a little flat – if it’s not a lot of trouble to add that in somewhere, would help girls like me! Hi Erica, thank you for the feedback. We have updated the recipe. Enjoy! This Mac & Cheese Casserole was very tasty. I made it when it was originally posted, and we LOVED it! I used “Cabot’s” white cheddar cheese, which I deem to be the best domestic cheddar. BTW, the word ‘macaroni’ is a broad term, so you need to specify ‘what kind of ‘macaroni’ to use,….”Elbow” macaroni, or whatever other type of pasta is being used in the recipe. I have a box of elbows in my pantry, and it says “Elbows” on the box, ….NOT “Macaroni”. To make a long story short, the words Macaroni & Elbows are NOT interchangeable. Nevertheless, the Mac & Cheese Casserole was incredibly delicious. So glad you loved it, I agree, Cabot is the best!! My box actually says “macaroni” but truthfully, any short noodle would work in this recipe. I made it. Very good! Used a little garlic powder w/ parsley instead of onion powder. Also FF half and half for cream. Always use white Xtra sharp cheddar cheese. I’ve have never put in soup before but it was good! We don’t like toppings so omitted it and added that cup of cheese to the recipe! Makes a big batch too! I divide it up before baking into several meals in foil pans or gallon ziploc bags and freeze! Share with family or to use later. Then we bake it till done and the top is crispy and lightly browned! Excellent! I really wanted to like this recipe but found it to be very bland. Even after doctoring it up with salt, pepper, and hot sauce there was very little flavor to it. I have been on a long search for the perfect creamy baked mac and cheese, and I have finally found it! When I tell you I have tried at least 10 recipes, that is no exaggeration. The tips about shredding your own cheese, not over baking, and rinsing the noodles were very helpful and make all the difference. I think the can of cheddar soup also helps with the creaminess (other recipes I have used before did not have that ingredient). Instead of using all sharp cheese, I used half medium cheddar and half seriously sharp cheddar. I don’t know if it made a difference in taste, but it turned out great! I will definitely be adding this to the rotation! Thanks for the recipe! Thanks Jessica, that is great to hear! Glad you loved it, it is one of my favorites too! Very nice and perfect recipe. Hi! Is this a recipe I can make the night before then bake the next day? Yes, I’ve made this recipe ahead of time. I’d suggest you ensure your pasta is very al dente and taking it out of the fridge at least 30 minutes before baking. You may need to adjust the cooking time slightly to ensure it is heated through. Enjoy! My mom made a baked Mac and cheese like this, but added cubed ham pieces, and topped it with bread crumbs. She would bring that to church pot lucks, and women’s lunches, and was always the one most asked for her recipe. I just wanted to share an alternative to your recipe. I’m so excited to try this! The reviews make my mouth water! One question; can I make it ahead and store in the fridge? Even when it was over baked and the soup was forgotten, everyone loved it. I made it for Thanksgiving and used the breadcrumb topping. Everyone requested I make it again for Christmas. Even my partner, who can’t stand mac and cheese. Originally it was baked the right amount of time, but people were late, so it got cold and we added a cup of water, and a little more than a cup of milk then baked it for 5-10 minutes. Wala, it was fixed. So glad everyone loved it, it’s one of my personal favorites! 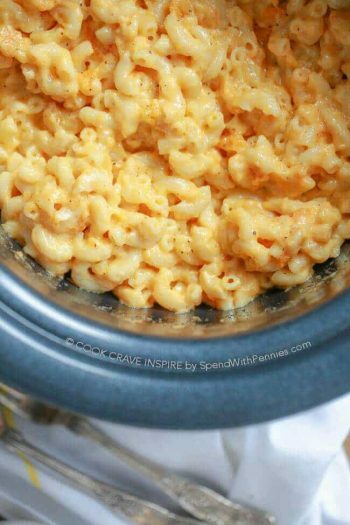 My husband and I love this Mac and cheese! I use the cheddar soup and do the topping. My husband needs meat at dinner so sometimes I add diced deli ham. Myself, I like it exactly as written in this recipe. I just bought the ingredients to make a double batch for a holiday party tomorrow. I know it’s going to be a hit! Thank you! I am so glad you guys love it Erin, hopefully it is a hit at the party! I love this recipe but need to make it for a huge crowd in a crockpot. What are your suggestions? 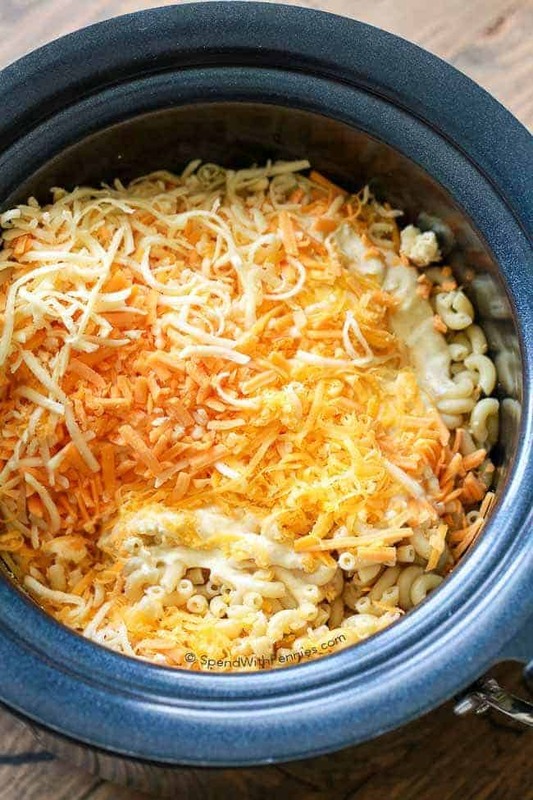 I haven’t tried this particular recipe in the slow cooker, I do have a crock pot mac and cheese which I’ve successfully tripled in my large slow cooker before. I am constantly trying new versions of mac and cheese to continue to excite my family and friends as we are from deep south. Honestly, to obtain creaminess I used to use velveeta. Not anymore!!! Such a fan of the canned cheddar soup! So glad that your kids love this mac and cheese Melissa, mine too (and me!). I make this with gluten free macaroni and gluten free flour. Turns out great. Thank you for sharing Lisa! Some readers will love to hear that! This was, hands down, THE BEST mac and cheese I have ever made. And I am a mac and cheese connoisseur! I doubled the recipe, shredded my own cheese, it was a little labor intensive, but totally worth it. I did end up with about a cup or so of extra cheese sauce that simply did not fit with the macaroni even in our largest casserole dish. I baked it for about 35 minutes because the recipe was so large, and it turned out perfectly except for one thing. There was a lot of oil on top of the casserole but my husband sopped up most of it with a paper towel. I wonder if a breadcrumb instead of cheese topping would be better next time. This was a huge hit! Total crowd pleaser, my little nephew had 4ths! So glad that you loved the mac and cheese! Stay tuned for my baked mac and cheese with a breadcrumb topping – coming up soon! Made this to take to a friend’s house for Thanksgiving. My friend said it reminded her of her grandmother’s. Everyone loved it (even the worst critic…me.) It was so easy to make and so delicious. It made my favorites board on Pinterest!!! Thank you so much for ending my search to find the best mac and cheese recipe. Happy Holidays!!! I am so glad everyone loved it! It’s our favorite mac and cheese too! By far best dish I’ve ever made. Made it for Thanksgiving and the whole family loved it. The crumbles on the top added a whole new level of flavor. My dish was the main attraction, it was even better than the turkey! Im only 14 and barely every cook, and I was able to make this. Definitely making it again for Christmas. I am so glad you loved it Francis! I agree, the topping is the winner! Great job! Can I substitute milk for evaporated milk? I haven’t tried this with evaporated milk, the recipe sauce is very creamy as written but I’m sure it would work fine. The flavor and texture of Velveeta cheese is quite different than a real cheddar so that would change the sauce. While it would still taste great, I haven’t tried it so I can’t say for sure. If you have shredded cheddar cheese, I think that would work best. Question about the cream – is it half and half or heavy whipping cream. I type in just cream in my grocery list online and those are the only types of creams (besides ice cream) that comes up. Which should I use? It is half and half. Enjoy! How many servings are in this dish? I need to make for approximately 50 people and not sure how many times to multiply it. Hi Erin, this recipe makes 8 servings. Enjoy! This is my go-to recipe! My family loves it! The only change I make is omitting the onion powder, just gives a strange flavor in my opinion. Otherwise this is a fantastic recipe! Thank you for sharing! Glad to hear that you love it Stacy! Would this be alright to pre-make in the morning, put in a foil baking pan refrigerate and cook that evening? Yes, I’ve made this recipe ahead of time. I’d suggest you ensure your pasta is very al dente and taking it out of the fridge at least 30 minutes before baking. You may need to adjust the cooking time slightly to ensure it is heated through. would almond or soy milk be okay for an alternative to milk? I have only made the recipe as written but think it would work. Iit’s my favorite comfort food so I’ll give this recipe a try. The one my daughter-in-love makes is my favorite, so we’ll see how this recipe stacks up to hers. It’s a great hit, so hope you love it Irwin! It is looking very delicious and I love macaroni. I was looking for nice recipe on macaroni and i have found one here on your website. Thank you very much for sharing this informative post with us. This is the best mac n cheese ever! The soup gave it a bit of a tangy flavor, and it’s so easy to do. we cut the recipe in half, as it was just two of us, and it gave plenty for leftovers. My mom had seconds, and kept taking small spoonfuls until she probably had thirds, lol. My mom doesn’t care for leftovers, but as I was cleaning the kitchen, she said “be sure you have enough to take home, but if there’s enough, leave me some”. Oh, there was plenty, for both of us. My mom just heated her leftovers, but I added a tablespoon or two of milk to my leftovers before heating, which gave it a really creamy consistency. I was wondering, if one didn’t have the condensed soup on hand, could you just add a bit more grated cheese (maybe a mild cheddar instead of sharp to keep it from getting too sharp a cheese taste?) or would that change the consistency too much or make it harden? I’m so happy to hear that you and your mom loved this mac and cheese! This recipe is just great without the soup. You can leave it out! If adding more cheese, you may want to add a touch more moisture. Did you use prepackaged cheese or freshly grate your own cheeses? Did you remove your sauce from the heat before stirring in the cheese? Did you make the recipe ahead of time? I grated my own cheese (medium cheddar). I stirred it in after removing sauce from the heat. I did not make it ahead of time. I did use the soup. 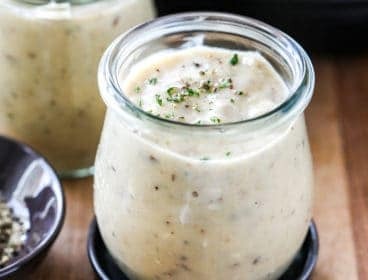 I can’t say for sure what went wrong, this recipe does come out with lots of smooth sauce when I make it. Sorry it didn’t work out for you. This is THE BEST mac & cheese ever!! And we LOVE mac & cheese at our house. Have tried several recipes I’ve found on line, and this one tops them all. My husband says, “This is a keeper!” Made it exactly as written — wouldn’t change a thing. Such a nice blend of creamy, cheesy goodness. So glad you loved it, it’s definitely one of my favorites too! I made this macaroni and cheese for the 4th of July and everyone loved it, especially my macaroni and cheese LOVING husband! He asked me to keep this recipe as my new go-to! So creamy and absolutely delicious! So glad your everyone loved it Elizabeth! We do too! This was amazing! We made it without the bread crumbs on top and only baked for 10 min because we didn’t want to dry it out. We used the condensed cheddar soup and it was incredible. Thanks for the recipe! You’re welcome Jess! So glad you loved it! This was terrific! I had never made macaroni and cheese (other than the box kind). I added green onion, which was so good. I also used Ritz crackers, bacon bits, and finely diced swiss cheese for the crumble topping. Thank you so much! LOVE! Have you every had to double the recipe? Would i just double all of the ingredients? I have easily doubled this recipe and it’s worked perfectly. Increasing the ratios as written will work just fine. I cooked this according to the recipe, and the sour cream curdled. I cooked it for the shortest amount of time also. It tasted ok, but it didn’t look as appetizing and obviously the texture was off. It definitely wasn’t worth the extra calories. Everyone at the family meal agreed that they preferred our classic Mac and cheese. Sorry to hear that it didn’t turn out for you. We’ve made this as written many times and it’s worked perfectly. Thank you for trying the recipe Lysa! Did I miss something? I don’t see sour cream in the list of ingredients or directions. I don’t think so Gina. Lysa may have added some sour cream. I don’t see sour cream in the baked version. Is it in the crock pot or instant pot recipe? there was NO sour cream, she said cream as in half & half. I am wondering what percent milk you use in the recipe(skim, 1%, 2%, whole)? Is one better to use? Any would work fine, I usually use 1% or 2% as it’s most often what we have on hand. I’d like to make this for a potluck tomorrow, but will need to use 16 Oz of pasta. What measurements should I use for the other ingredients if using the full 16oz box? This was delish! My husband and I loved it! Thank you! I’d like to make this for the 4th and freeze ahead of time. Any one have luck with that? I have not tried freezing this recipe. Often recipes with milk don’t freeze well so I can’t say for sure how it would work. Some readers have had success as you can see in the comments. So happy to hear Nadia! OMGoodness this is sooo good! I added extra of everything and chopped up a precooked ham to add in. Rave reviews! So glad you loved it Michelle! Absolutely delicious!!! The addition of the Cheddar Soup is GENIUS. Thank you! So glad you loved the macaroni and cheese recipe Felicia! As a big fan of this recipe that has made it several times, I thought I would add a few comments. 1. Use the concentrated soup, regular cheddar cheese soup, not the low fat kind. The can of soup is the secret ingredient that adds just the right amount of “Goosh” to this mac. 2. DONT put more pasta in this!! When you stir the al dente mac into the cheese sauce, it DOES look like it is wayy too saucey, but after it bakes for a half hour or so, the mac expands, and once you let it cool, it will be the perfect saucy consistency, not DRIED out!! I was a little confused about the 12 oz of mac, but used a 16 oz. box, and just took a little bit out. 3. Use old school, regular macaroni. The Cavatapi pasta I have is thinner, and by the time you boil it and bake it, it doesn’t stand up as well and can be mushy.. Hope this helps! ENJOY! Thanks so much for leaving these tips Alex! I am so glad you have enjoyed the recipe! I am going to make this today. Just a quick question; what is the fastest and easiest way to shred the cheese? I use a food processor or grate it with a cheese grater. 2) I sometimes use half gruyere/half sharp cheddar and sub nutmeg for the onion/garlic – yummm! This is SOOO good! I have tried three different recipes and they all failed. But this is exactly what you crave in a Mac and Cheese. I don’t think I will ever be able to serve the stuff in the box again. This was easier to make than I thought, extra bonus! I added some Creole because we like spicy! Amazing! Even the picky boy liked it! Thank you for the recipe and instructions! YAY!! So glad you loved it because it’s one of my faves too!! This is the second time I’m making this recipe. I liked it so much I’m making it again. One of the easiest & tastiest mac & cheese recipe I’ve ever tried & I think I tried quite a few. Keep up with the good recipe like this one! I enjoyed making this recipe . So glad you loved it Delores! My Mom always made homemade macaroni. Thanks a lot for sharing. You’re welcome! So glad you enjoyed the recipe. Happy to hear you love it Danny! Oh my! Just got done making this delicious mac and cheese and it is so good!!! going to have to make this more often, and its so easy to make! Thanks for sharing love. So happy to hear you love this Celeste – a weakness of ours! Questions: can I substitute corn starch for flour? If yes, please let me know of the process or how to add it. While I haven’t tried it, 1 part cornstarch replaces 3 parts flour so in this case you would need about 1 tablespoon + 1 teaspoon of cornstarch to replace the flour. The method would be different in that you would need to mix the cornstarch directly into the cold milk before adding it to the pan (and not into the butter beforehand). Awesome! Came out very creamy, did use the cheddar soup. Made topping which came out crunchy. Definitely will make it again. Hubby loved it! Thanks for the recipe. I made this one time to try and it’s my go to for gatherings now. Everyone at church specifically requests it along with my family. I adjust to whatever I have on hand. So I usually just use milk, but sometimes I will sub the Parmesan cheese with a Mexican blend and just Cheddar with a little seasoning salt. Yummo!! So glad I found this one, it’s for sure a keeper!! I’m so glad you love it, it’s one of our favorites too! This was delicious! Made it for the super bowl and everyone loved it! I did put the panko crust on the top. Loved the creamy inside and crust texture on top! Followed recipe to a tee and no changes are needed. Thanks Holly! Wow! Wow! Wow! I made this Mac and cheese yesterday for super bowl Sunday! Gone! It was a big hit.Very creamy and tastey.I used Cavatappi pasta (16ozbox) I did add the Chedder cheese soup! Love it! Will be making this version again! Thank you Holly! Yay, so glad you loved it as much as we do! X the can cheese. Add sliced jalapenos and cut up green onion. Hi, Holly! Was looking for something for our Monday family dinner get together with kids, spouses & grandkids. Wanted a good, but simple mac and cheese that both the younger ones and the adults would like. Doubled the recipe and it was perfect! The only change (due only to my having just 1% milk, in an effort to make it a bit richer) was using only 1 cup of milk with 1/2 cup of fat-free half n half and 1 cup of regular half n half. Served it with a variety of hot sauces and fake bacon bits (as they were all I had). Great salad on the side and everyone loved it! Next time will have real bacon and perhaps some chopped up green onions as options as well. This will definitely be a go-to recipe in our household. I am so glad that you enjoyed this recipe Sue! I made it without the cheese sauce and it was delish! Easy to follow recipe and measured out perfectly. I I will keep this one in rotation as everyone in my family loved it. I want to make this for a Mardi Gras party. I want to add Cajun seasoning and cooked shrimp to recipe. What do you think? I want to make this Mac and cheese for a Mardi Gras party. do you think it would be okay with Cajun seasoning and Cajun cooked shrimp? I think that’d be delicious! My husband loves cheese, so when I came across this recipe, I just had to try it. It turned out so great. also liked the cheddar soup in it. Thank you. Holly is it necessary to use parmesan cheese? I’m going to make this for a large group of people. I know some of them don’t like parmesan. I just mixed the cheese mixture with the pasta and holy cheese! It seems to me there is WAY too much cheese for this amount of pasta. I can’t imagine that 20 minutes in a 350 oven is going to change the fact that the pasta is currently swimming in cheese! I’m in the process of boiling another box of pasta as we speak. If you add extra pasta, it could potentially come out drier than intended. 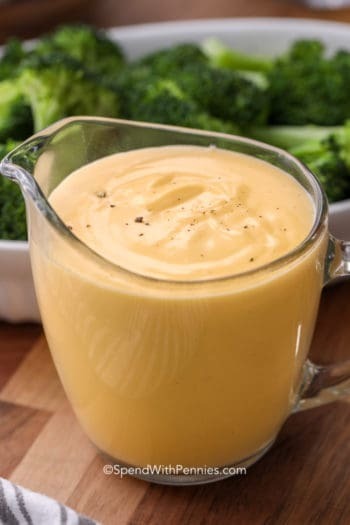 This recipe works perfectly as written and is intended to have a nice cheesy sauce. I am sure you did not mean this to be as defensive as it sounds. As a long time follower all I could think was WOW! :) Not defensive, just wanted to let Sally know that if she adds more pasta and then bakes it risks coming out dry… it’s intended to be a bit more saucy than most mac & cheese recipes as I hate dry mac & cheese. I usually use either 16 oz or 18 oz of large/xlarge elbow macaroni instead of regular 12oz macaroni and it always turns out great. A lot of creamy sauce but never too much or too little. I have never made homemade mac and cheese. I love it but my spouse does not. 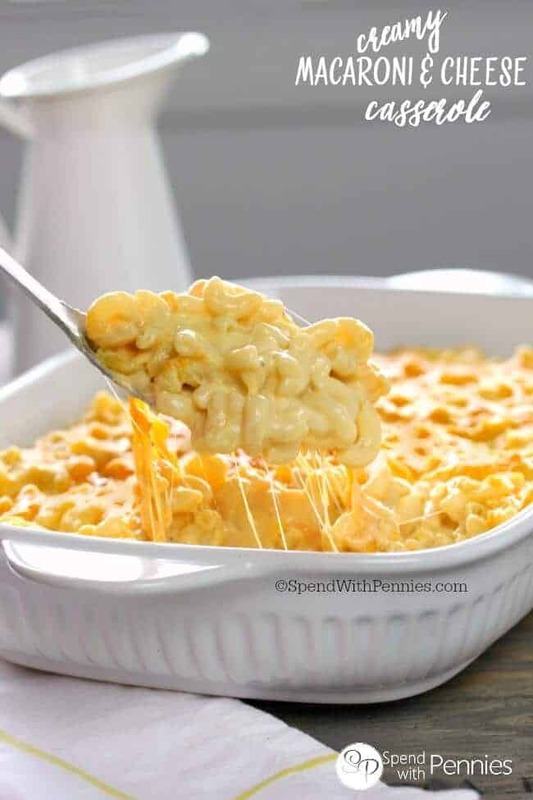 When I saw this recipe I decided to give it a try – and it was the best mac and cheese I have ever eaten and the only mac and cheese I will make from now on! I also added some cubed ham to it (about a pound and a half, cubed into bite size pieces) and made it our main course for dinner. My husband, who does not like mac and cheese at all, gave it a try, ate a huge portion of it and said 2 or 3 times how much he liked it! 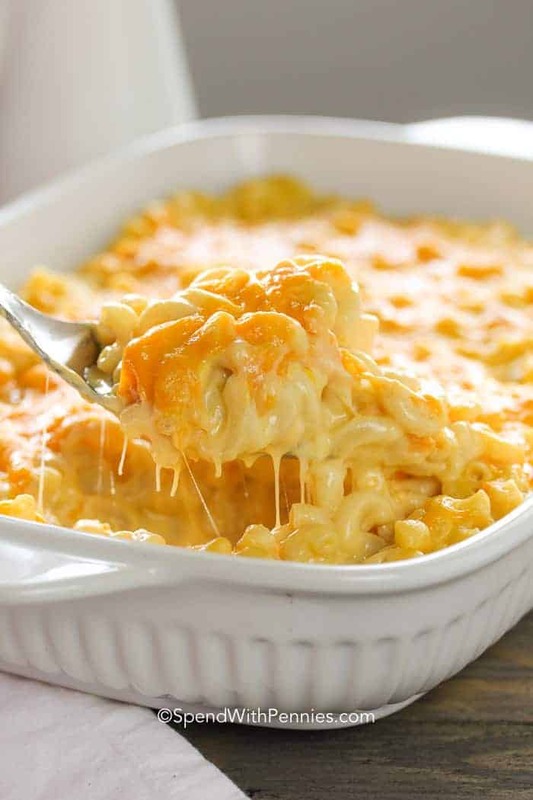 Thank you for this recipe, it is without a doubt the best mac and cheese ever! From one mac & cheese lover to another, I’m so glad you loved it! Just made my first casserole and this one is really good!!! I made this recipe for Christmas Lunch and I added sweet corn. It turned out delicious!!! I made this recipe for thanksgiving and was a hit. Also I was required to make it at New Year’s dinner again. I am happy. I am so glad this recipe was a hit with your loved ones! OMG. This is some damn good mac and cheese! I have tried tons of recipes and this is AMAZING! Perfect combination of baked and creamy. This will be my go to, for sure! 2) I can’t find “light” cream. What else can I use? C’mon, people….spend five minutes reading the comments before you ask your question. Chances are, it’s been answered 15 times. I’ve made this twice and the first time I made it with half and half (for the light cream) and substituted evaporated milk (for the regular milk) because I only had skim on hand and didn’t think it would be “fatty” enough using skim. The second time I made this I used heavy cream in place of the light cream and 1% milk for the milk. I also doubled the recipe using two 12oz bags of macaroni. Both times it came of perfect. This recipe is pretty fool proof. Love this one! I use the soup or dried mustard extra onion powder. I don’t use the bread crumbs just another type of cheese on top. Ok, I’ve searched as much as I could through the comments. How many ounces is your canned cheese soup? I have a can that’s 14.75 and one that’s 10.75. Big difference so I don’t want to mess it up. 10.75 oz. I’ve updated the recipe, sorry for any confusion. This is my go to when making Mac and cheese! Only change I make is omitting the onion powder and adding a dash of cayenne pepper! ALWAYS rave reviews from my family! Best Mac & cheese ever! My family loves it. Can you use sour cream instead of half and half? I have only tried this as written. Please let us know how it works out if you try it with sour cream. I made this without the soup, and added cream cheese with 2 cans tuna, paprika and peas for a more homemade casserole. Delish!!! If making this for the next day would you recommend doing all the directions when cooking and merely re heating it in the oven, or should I follow until the last step and baking it the day of? Sorry I’m still new to cooking. I would suggest baking the day of, it can tend to dry out if baked and reheated. Just curious if Johnny (or anyone) ended up making a day ahead and then cooking day of? How did it turn out? I’m sure MANY people would love to make this ahead of time! I HAVE to try this! My 14 year old lives on mac ans cheese! I made this for Thanksgiving this year and it was excellent! I rarely ever comment on recipes, but had to on this one. Every mac and cheese that I have made, has been somewhat dry and never creamy, but not this one. It was super creamy and delicious – everyone loved it. Couple things that I wanted to note, is that I used half and half and also used freshly grated parm cheese, since that was all I had on hand and it worked perfect. I highly recommend this if you are looking for a creamy dish. Thanks for sharing this recipe – it will be made several times in the near future! Disappointed. I was hoping for and looking forward to a flavorful, creamy dish. It turned out bland and thick. I even used the optional can-o-cheese. Wasn’t kid approved either. Everyone raced over this dish. I will definitely make it every holiday. I did however leave out the can soup and added 1/2 cup sour cream and 4 ozs philly cream cheese. Delish! I made this dish for Thanksgiving Dinner. Well it was a hit. The whole family gobbled it up. I was definitely the show stopper. Now the family wants this mac & cheese more then just for Thanksgiving. Great receipt!! I made this recipe and it turned out wonderful. This is the most tasteful sweet potato pie I have ever made. This is right up there with my mom’s recipes. Thanks! Made this today, it is amazing! If I’m using condensed cheddar soup do I still use milk? You will use the milk called for in the recipe but you will not add additional milk to the soup. If you prep it in advance, make sure to stir it before cooking! I’m curious… Could I bake this dish at 350 for a longer time? Would it have the same results? You can but you’ll want to make sure it doesn’t over bake. First off this is the best Mac and cheese ever! My grandmother in-law and her husband love it so much she asked me for the recipe. And for all of the people asking if it freezes well, it does. She makes big batches and freezes them in smaller containers so she can take out individual portions for dinner. When I make this I’ve used regular heavy cream every time and whatever milk I have on hand and it has been great each time. I use the soup every time, I can’t imagine not using it because of how creamy and good it makes it. Not dry like other recipes. The parmesan cheese just makes it that much more flavorful as well. I make this for every holiday and will be making it this Thanksgiving and Christmas as well. I have not tried freezing this recipe. Often recipes with milk don’t freeze well so I can’t say for sure how it would work. I would like to make this for Thanksgiving. My mom always makes her mac n cheese the day before by assembling it all with the cooked pasat and refrigeratin over night. Then she takes it out tops with cheese and bakes. This saves time for Thanksgiving Day. Have you premade this recipe? Do you think it will be okay to do that? First grate the cheese, then measure 4 cups for this recipe. This would be approximately 1 pound of cheese. Self rising flour or all purpose? I want to make this for Thanksgiving! Do you think it will taste okay if I prep everything in the morning at home and bake it before serving a couple hours later at my in laws? Thanks in advance. Hi Angel, Yes that will be fine! The holiday crowd will love ❤️ this!! When you say Parmesan cheese, so you mean grated or shredded? You will want to use shredded parmesan cheese from the refrigerator section of your store (not the powdered grated parmesan). This hands down THE BEST mac and cheese I have EVER HAD! I will continue to use this as my go to recipe. Thank you SOOOOOOOO MUCH FOR SHARING this. I think this looks so delicious! Can’t wait to try this, but I do have a question I can not get to the store so for the cream can i use sour cream? I have not tried sour cream but I do think it would work. You could certainly just leave the soup out altogether. I always make this recipe and love it every time! The only thing is that I bake it for only 10 minutes because the sauce disappears if you bake it the full amount of time. Definitely my favorite mac n cheese recipe! I’m so glad you enjoyed it Nancy! Didn’t have the soup. Used a 3/4″ “slice” off a block of Velveeta and melted it with the cheddar. Everyone loved it. Also used 16 oz. noodles, and there was still plenty of cheese sauce. Will definitely make this again. I am glad this was a hit with your family! This is some awesome MAC AND CHEESE. Easy to make and delish! Been making it for years. Made this tonight, and split the recipe in half. I forgot to buy the soup, so I made it without, and also used heavy cream since that is what I had on hand. I cooked it for 20 mins, and the noodles were perfect. My only issue was being able to “feel” the flour. Not terribly, but it was slightly gritty. Since I halved the recipe, there was very little flour and butter slurry to continuously mix, but I could have done a better job of getting it smooth. The flavor overall, was really good! I have some picky eaters in my house, and 2 of my kids really liked it, one of which doesn’t eat any mac and cheese I make whether it’s out of the box or homemade. He said it tasted like the school’s mac & cheese, and apparently that’s a compliment! I definitely recommend giving this recipe a try! I am glad to hear that your family liked the recipe, Leah! The soup definitely helps to blend the flour for thickening without ‘feeling’ or tasting it. I don’t usually comment on blogs, but I absolutely had to after making this recipe last night. It was wonderful! I didn’t have light cream, so I substituted it with 2 parts milk (2/3 cup) + 1 part heavy cream (1/3 cup) in addition to the 1 1/2 cups milk specified. Came out perfect! I made the béchamel on the stovetop with the heat set to 4 (just before medium) as not to burn the butter. Everything mixed and thickened wonderfully. I had started preheating the oven as the water was boiling for the noodles, so by the time it was ready to go into the oven it was hot enough that it only took the 18 minutes to bubble. I’ll definitely be making this recipe again! I wanted to note that in the ingredients you mention to use salt + pepper to taste, but you don’t actually dictate when they should be added. I assumed, of course, that they were to be added with the other spices, but you might consider mentioning that part to avoid any confusion! I am so glad you enjoyed this recipe! I am glad you were able to make it work without the light cream! Super good! It’s a keeper! My family loved this recipe! It was amazing. Thanks for sharing. I skip all the multiple ingredients and have taken boiled macaroni and combined it with a big ole brick of Kraft cheese as needed and babied it through the oven process and it’s absolutely wonderful ! Much simpler and extremely good . So I would like to make this recipe for a party, and I will need to serve around 50. I’m planning to buy 2 big aluminum disposable pans, but I am wondering about the increase in ingredients. Sometimes when you double, triple, etc the recipe, certain ingredient amounts change. Any advice for making the recipe for that many people? And how much do you think I need to multiply the recipe by to get that large of an amount? Thanks!! Oh, and amount of time to cook with a larger batch? It’s hard to judge since I haven’t seen the pans you’re using. If using disposable pans they don’t hold the heat as well as a regular pan so if it fits, I’d suggest placing cookie sheets under them to help with heat. If stirring in between I would think in the range of 40 minutes. I hope that helps! I have easily doubled this recipe and it’s worked perfectly so I’m sure increasing the ratios as written will work just fine. I would suggest making about 6x the recipe and dividing it over the 2 pans. When cooking it, you’re just really heating it since everything is already cooked. I would reserve the cheese you are topping it with and cook the two large pans stirring part way through cooking to ensure the middle is hot. Sprinkle the cheese over the pasta about 10 minutes before removing from the oven (you could broil it slightly just before serving if needed). Enjoy!! Made this man and cheese and it is wonderful and very creamy! lol meant MAC and cheese, NOT MAN and cheese! LOL! So glad you loved it! I had to go to the store to buy the cheddar cheese soup, and, dry mustard. I am going to be making this today. Hi Holly! First of all I want to say this is a great recipe. My family is hard to please when it comes to American dishes but they loved this one! I wanted to ask you if I should be using pre-packaged shredded cheddar cheese and Parmesan cheese or if I should grate the cheese myself? Hi Caleb, Either way will be delicious! You can shred it if you have time, but your recipe won’t suffer if you use pre-shredded cheese! Thank you Holly for that delishous recipe for million dollar spagetti cassarole’ it was out-of-this-world. You are so kind. Thank you for your kind words JoAnn! I am so glad you liked the recipe! Is this good recipe to prep ahead of time to bake like the next day? I’ve made this several times and loved it. To begin, GOOD MORNING FROM LONDON ONTARIO CANADA….. I made this last night and OH MY GOD IT WAS AMAZING!!! 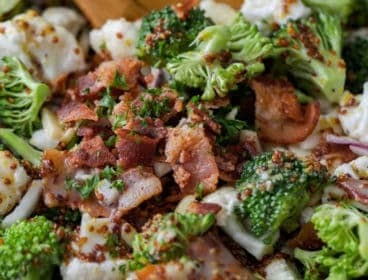 I added Broccoli and Cauliflower and crossed fingers as i plated out some for my VERY PICKY Grandchildren! They totally DESPISE VEGETABLES!!! And to my surprise all 12 of my Grandchildren came back for seconds!!!! Thank you so much for making me the BEST NANA IN THE WHOLE ENTIRE WORLD!!! Again…… Thank you Thank you Thank you. Now i finally have my favorite Grandchildren asking for VEGETABLES!! April Lewis London ONTARIO CANADA. Ps: Im only 53yrs old and expecting another Grandbaby any day. So 13 its going to be and I can’t wait!!!!! Bring them them on!! After all God only gives you what you can handle RIGHT?!!!! Has anyone ever doubled this recipe? I need mac n cheese for 20 people. This recipe can successfully be doubled however I would suggest cooking it in two 9×13 pans. You may need to increase the cooking time very slightly with two pans in the oven. Hi, I’m going to try this for a BBQ this weekend. I’m going to double the recipe and we planned on putting it in the smoker instead of the oven. Would I be ok to cook the noodles al dente? I know at the bottom of your recipe it says “don’t over cook” thank you! I do cook them al dente so they don’t get mushy. Although I haven’t tried it in the smoker, I bet it’s going to be amazing! I just made this last night and it turned out great Any tips on reheating without it drying out? Light cream such has half and half. You’ll want it to be about 10-12% mf. I just made this for our early Christmas dinner tonight. WOW!!! This was the best baked macaroni and cheese I have ever made or eaten! We added some ham but next time I will add crab. I did not add in the can of soup and used a mix of sharp cheddar and co-jack. Because my 9×13 pans were in the washer, I used a deep 2qt casserole. Not a lot of crispy edges but lots of creamy mac and cheese! I have to say that I love this recipe. I have made it a few times and my family loves it . I did not change a thing, or add anything to this recipe, thank you! I’m so glad your family enjoyed this recipe! This is pretty close to my grandmother’s recipe what she would make for me every weekend. I miss her so much and her Mac and Cheese. She would change it up every once in awhile depending on who was coming to dinner. You know there is always a fussing or finicky eater. One of my favorite changes was to replace the Cheese soup with Tomato soup. So yummy! Or she would put down a layer of the Mac and Cheese, top with fresh sliced tomato then the remainder of the Mac and Cheese. She always topped hers with bread crumbs. Making this for Christmas dinner and know it will be delicious. What great memories you have Sandra! <3 The tomato soup would be SO good in this recipe!! Enjoy and Merry Christmas! Can I use the bagged shredded cheese? Yes, the pre-shredded cheese works well in this recipe. I’m so glad you love it Cassie, it’s one of our all time favorites too! Great ideas for additions! This was fabulous!!! So creamy and tasty! The family loved it! I made this for Thanksgiving yesterday and it was a hit!! Also just as delicious as leftovers the next day :-) Thanks for the recipe! Oh my! This recipe is now my go to Mac and cheese. This was a hit as a part of our Thanksgiving dinner. Thanks for sharing. I used block cheddar cheese (cut into squares) and it took a long time to melt. Also, step 3 the stuff did not thicken. Did I do something wrong? I still think it will turn out great, but just took longer to prepare for me. Did you add the full amount of flour to step 3 and cook until it was bubbling? It should thicken to a sauce consistency (You can view the video on Facebook here). Either way, I hope it’s still delicious! This turned out great! Thank you. I will say I was hesitant in using canned soup. With that being said I actually tasted the sauce before adding the soup and it was delicious on its own. I decided to then add the soup and it was great too. I have picky mac and cheese critics (kids) and they are happy. I didn’t bake this. I cooked it this morning for Thanksgiving, did not top it with the final cheese yet. I placed it in crock pot on warm and later when guests arrive I will place remaining cheese on top. I doubled the recipe for a large croud and used 16oz boxes. Plenty of sauce. Thank you Sarah! I’m so glad you enjoyed it, keeping it warm in the slow cooker is a great idea! Thank you for sharing!! What are the measurements if your using 16oz of pasta? You would want to add 1/3 extra of all of the other ingredients. My store didn’t have the cheese soup, they were all out. I bought cream of chicken. After reading all the comments, I’m torn between adding the chicken soup or just leaving it out. What do you suggest? I would suggest mixing everything together without the soup including the pasta. Once it’s all mixed (before you put it in the pan) have a taste. 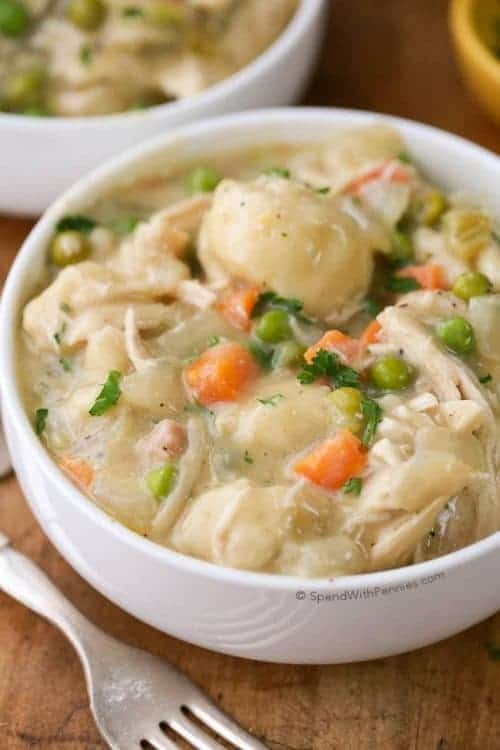 If you decide to add in the cream of chicken soup, you can certainly add it in at that point, stir well and then put it in your 9×13 pan. Is this something I can make ahead of time and then just pop it in the oven before eating? <3 YAY! Definitely my favorite too! Happy Thanksgiving! I do not have a 9×13 dish. Do you think I could use my 2.75 quart dish? Parmesan cheese from a bottle or shredded? I’m making this for thanksgiving. I plan on making before we head over to friends for dinner. It’s a bit of a drive. How can I prep then just pop in my friends oven when I get there? Will this. Enok? Will it still turn out? Half and half is basically half milk and half heavy cream so you can certainly mix your cream with milk to create a light cream. You can find more info on half and half here. You can prepare it before you leave and let it cool. It will be fine for a few hours to put in the oven at your friend’s house. Happy Thanksgiving! So don’t bake it at all until I’m at my friends? Just prep everything and put in the pan? You bet, just bake it once you arrive! I bought coffee creamer as the light cream, will this be ok? As long as it’s not sweetened it should be fine. Hello would you suggest I take it out 30 mins from my fridge before baking it and how much longer would you suggest baking it for? Yes, I would suggest you take it out of the fridge 30 minutes before baking. You may need to add an extra 5-10 minutes, you will just want to check that the center is hot and the cheese is melted and bubbly. Hi I was just wondering if when you add the onion powder and the dry mustard powder if it is really noticeable when eating? I don’t like mustard or onions and some family members don’t either so I was just wondering as I might make this for thanksgiving. Thanks! The mustard powder doesn’t add a mustardy flavor at all. I personally like the flavor of onion powder in this dish so it’s hard to say however you could certainly reduce the amount. Hi! I’m needing to make 2 of these 1 for a thanksgiving lunch at noon and then 1 for 4pm the same.day. do you suggest baking them both at the same time or can I put the 4pm dish together and bake it when I arrive at my in laws? I would prep them together and bake the second dish later in the day. I add chopped up broccoli and sausage (removed from the casing and fried up like ground meat) to my mac and cheese and it’s delicious! The spices in the sausages add loads of flavor. And broccoli and cheese…. Come on, who doesn’t love that! Lol. Plus it’s a good way to get your veggies, just cover it in cheese! FYI Re: freezing it is just fine. After its all cooked, let cool, cover in foil, then put it in a freezer bag sealed tightly. To reheat, thaw in the fridge overnight, bake at 375 with the foil on for 30-40 minutes. Remove foil and bake another 15 until heated through. Great ideas Candi! Thank you so much for sharing! What do you mean by light cream? Like reduced fat milk? Any light cream (about 10-12% MF) or half and half will work in this recipe. I need to double this recipe, does the cooking time remain the same? If you double the recipe, I would suggest two 9×13 pans. The cooking time should remain the same. I am making this for 8 people would I need to add to anything for this? Also, what size baking dish do you recommend? I use a 9×13 dish for this recipe. This should be the perfect size for 8 side dish servings. Hi Holly! Quick question & im sorry if 40 other people have already asked you this, I tried reading through the comments but there are just too many!…very popular recipe! So my question is, can this be baked the night before & thrown in the oven to reheat the next day?…..or should I just prep & assemble it & baked for the first time the next day? Yes, this is equally delicious reheated the next day! Good Morning! 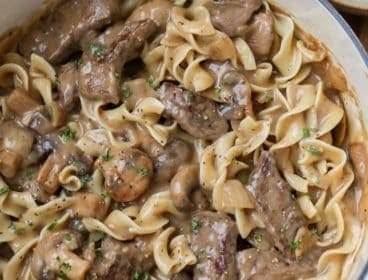 I just found your recipe last night and was wondering how you thought it would fare being kept warm in a crock pot (or being ‘baked’ in a crock pot)? Thanks so much for your input and have a wonderful holiday season! You could keep it on warm for a little while (it’s very saucy so it would likely work well). If dairy gets too hot in the slow cooker it can separate and become grainy so you’ll just have to monitor the temperature to make sure it stays warm but not too hot. When you cook/boil the macaroni, do you make it aldente, so it finishes cooking in the oven? Or do you just cook it all the way? Yes, it is cooked al dente. Hi there! I am wanting to make this for Thanksgiving. I would like to cook/prepare everything at my house and then warm it up or finish the cooking at their house (its about a 20 minute drive to there place)… What would you suggest? I was thinking of doing all the steps and putting it in the fridge until we are about to leave and continue with step 6 at their house. Do you think it would turn out okay? That will work just fine.Happy Thanksgiving! Salt and pepper are listed in the ingredients, but not in the steps? You can add them with the other seasonings. Enjoy! Has anybody tried freezing this recipe and heating it up later? I’m looking for recipes to make pre-baby and this just looks oh-so-good! Thank you! This was delicious! I made it for a potluck and it went quickly. Luckily, there was just a little left for a midnight snack for this prego :) I used all 16oz of macaroni as some other posters have mentioned. There was enough sauce to cover that extra macaroni. Will make it again!! What do you use for the cream?? Hey!! This will be my second Thanksgiving and Christmas making your recipe and everyone loves it. Question, is I added 2 or 3 eggs for some who prefer the more thick casserole, do you think that will mess it up? Or should i just leave it how it is? I’m so glad your family loved this recipe! I haven’t tried it with eggs so I can’t say for sure. This recipe is very “saucy” so if you wanted it thicker you could certainly try adding the eggs or maybe add some extra pasta so there is more pasta in the sauce. I’d love to hear how it works out for you! I can’t seem to get the little chunks of butter/flour out of the milk/cream mixture. Any pointers to make it smooth before adding the shredded cheese? The flour should be added to the melted butter and cooked. The milk should be added gradually while constantly whisking and should be cold. Just put this in the oven. I did use the Cheddar soup and 12 oz of pasta. Next time I will use the entire box of pasta (16oz) Looking forward to dinner! Can i use Velveeta with this recipe? I have not tried this recipe with Velvetta. It is already very creamy without it and I’d think it may make it too rich. I’ve tried it and it’s GREATTTT!!!!! SOOOO Yummy!!! Just made it! Eating a big bowl right now!!!! Not your average mac and cheese when you add the cheddar soup. Delicious!!! May I link here from my blog? I’m so glad you loved this recipe Anna! You are more than welcome to link to my recipe from your blog. Thank you for this recipe, I am anxious to try it. I’ve never tried Parmesan cheese in Mac & Cheese but it does sound good. I don’t care for the bread crumbs on mine either, while growing up my Parents always made it that way & I never liked it. Scan this recipe be made ahead of time? If so would you bake and reheat? Yes. I would recommend removing it from this fridge at least 30 minutes before baking. You may need to adjust the cooking time slightly to ensure it is heated through. I have made several different homemade Mac-N-Cheese recipes over the years, and this one is by far the best i have had! (and also probably the least expensive to make!). Creamy and delicious, and heatens up so well the next day (others have been so dry). Made it just as you wrote, and it is Perfect! Thank you so much! It is now a part of my ‘permanent’ recipes, and i will never try another mac-n-cheese recipe. That is awesome, Cheryl! Thanks for sharing. I’m glad you liked the recipe because it’s one of my favorites! I plan on making this recipe for a Baby Shower I am having. Do you think it would work if I made it the day before, put in individual foil ramekin cups and baked the next day? How long do you suggest baking? Recipe sounds delish! Yes. I would recommend removing it from this fridge at least 30 minutes before baking. I can’t say for sure how long they would take in individual cups, you more want to heat everything rather than cook it. I’d think about 18 minutes would be good. I made a very similar recipe to this a while ago. Unfortunately for me the soup just ruined it. I used Campbell’s cream of cheddar and it even smelled horrible. I will make this one but definitely leave out the soup! I accidentally got grated instead of shredded parm but it’s still freash. How bad will that change it? Do you know how long I would need to bake this if I double it in one big pan? If possible I would suggest putting it into 2 9×13 pans. If you’re going to use one pan, you might need to give it a stir half way. I would cook it about 30-35 minutes, you’ll just want to check that the center is hot. This is not a casserole. According to Dictionary.com (#2) this would be classified as a casserole. 1. a baking dish of glass, pottery, etc., usually with a cover. 2. any food, usually a mixture, cooked in such a dish. LOL – I know these comments are a few years old but I can picture “Verita” and “Algernon” as cantankerous old know it alls. Like who cares if it is or isn’t a casserole? You’re welcome John! Happy that you are enjoying Spend With Pennies! going to try it but wondering about serving size not stated ,how many would this feed aprox.? You can prep this ahead of time. I would suggest taking it out of the refrigerator for at least 30 min before baking. You may need to increase the cook time slightly. HI! 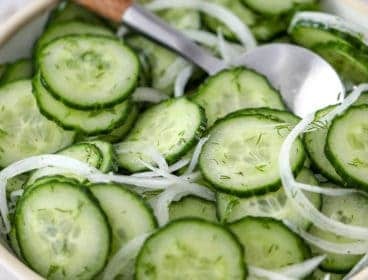 How would this recipe work to take to a kids function? Would it stay fairly saucy or would it goob up like regular mac n cheese? Thanks! It should stay creamy as long as it isn’t overcooked. If it cools completely the cheese sauce would definitely thicken. Made this tonight and it was soooooo good. thanks for sharing! This is not a casserole. This is one item in a casserole dish. Putting something in a casserole dish does not make it a casserole. You could put this in a coffee pot and it would still just be macaroni and cheese. The great thing about cooking is that we can all have our own spin on things. :) I make macaroni and cheese that is not baked which I don’t consider a casserole. According to Dictionary.com this would classify as a casserole. Can you freeze this after cooking? I don’t think I would freeze this recipe, dairy doesn’t tend to freeze well. Great recopes to make this fall!! I can’t wait to make them all!! Than you!! I’m sorry what is light cream. What section in the groceries store I found that at? You can use any cream that is approximately 10-12% MF. Can I make this the night before so the kids can pop it in the oven so dinner is ready when I get home? Just worry it will dry out. Thoughts? This is extra creamy and saucy so as long as it isn’t over baked it should be fine. Tried the Mac and cheese tonight it was great. I made this tonite and my family loved it!! I know I’ll be making it often!! Amazing twist and rake on the classic mac & cheese!! This looks so delicious. Have a receipt almost the same, only I don’t cook the macaroni. It cooks as it is in the oven. Next time I would leave out the onion powder!!! Are you able to make this in advance & bake the next day? Yes, this can be made ahead of time. The cooking time will need to be slightly adjusted if it is cold before baking. Can I use half and half for the cream? And also, I saw someone commenting on how 4 whole cups of cheese was too much. I am confused about how much to add now. So 1 cup of cheese is really 4 oz not 8 oz? Yes, half and half will work in this recipe for the light cream. You will need 4 cups of cheddar cheese for this recipe (the measurements in this recipe are not in oz). Okay. So just a regular measuring cup will work? I made this on Monday (8/15/16) It was so good!! Can I make it ahead of time and put in the fridge? Heat it up when we get home for dinner? Yes, that should work fine. You may need to adjust cooking time slightly. Made this Mac and cheese…..and promptly threw away all of my old Mac and cheese recipes! I used 2 cups of elbow macaroni for the 12 ounce portion. I used the cheddar cheese soup, as well. I only had 3 cups of cheddar cheese and 1/4 cup fresh Parmesan. I would have liked the cheese topping, but since I didn’t have the extra cup of cheese, I made the panko topping. It really was the best! Thank you for the yummy recipe….creamy and good! Yay!! I’m so glad you love this recipe as much as I do Marilyn! Lol to see this. Because i always see these food posts and crave them but this is in my fridge now!! WOOT WOOT!! I’m going to take your word for it and try it with cavatappi… and the paprika would definitely make it look great (especially since I take photos of my food : ). Love the side suggestions, thank you for sharing!! I agree, cavatappi pasta is the best for mac and cheese; its nifty spiral shape holds the cheesy sauce perfectly! I’ve just made this in the “bush”. I’m currently in Musina (a dusty town in Limpopo, the Northernmost province in South Africa), for 2,5 weeks with my husband. It isn’t exactly the “bush” but it’s fairly close , sort of like a frontier town. I just had a yearning to make this when I saw the post on FB. He wasn’t too convinced and to be honest I was worried because although I love pasta and the creamy Mac and Cheese was calling to me, I knew I would pay the price later. So we got what we could from the Musina Spar, and I made a few small adjustments, some to make him (and me) happy, others because we are in Musina and can’t have everything we want . So, I had brought some lovely organic grass-fed cream from home in Joburg, and further we bought some mediocre cheddar, full cream ultra pasteurised milk, corn flour (Maizena), unsalted butter (no salted available so can only assume there must be some bakers in this small town), the macaroni pasta and frozen peas and some delicious biltong (from the local Bakgat Biltong, biltong is a type of dried meat, like jerky). Unfortunately no cans of creamy cheddar soup to be had. We also don’t have many tools in our kitchen but we found a way. I sautéed finely chopped onion in the butter without colouring it, then added the corn flour and some English mustard because it was on the counter, and cooked it before adding the cream, milk, salt and pepper. I added frozen baby peas to the béchamel as well and brought the sauce to a boil. We boiled the pasta until very al dente, then put the pasta back into the pot. I added the béchamel to the just drained pasta, loads of grated cheddar and shredded biltong (our pot was too small to add the cheese to the béchamel sauce). We vigorously mixed it all so the cheese was mixed throughout and spooned the mixture into a buttered (greased) baking container and it went into the oven for about 15 min. It was delicious, not as creamy as your Spend with Pennies recipe will be, but it went down very well. I’m now having a lie down. Not very uncomfortable yet, and it was worth it. So sinful and so full of carbs! Sometimes I have days like today, where I can’t stop myself from enjoying something that isn’t good for me . Now, when I feel this way again and I’m home in Johannesburg, I’m going to find that can of cheddar soup and I will do it your way. I can’t wait. I love your adaptations I’m sure some of the fresh products you added were delicious in this recipe (as frozen peas would be too). I’m so glad you enjoyed it.. and I agree, we all need to indulge a little from time to time! Would be nice if there was a print link. The print link is located next to the ingredients just under the small recipe photo. My macaroni and cheese always gets gummy and clumpy the next day. What do you think I’m doing wrong? You’ll want to be sure you don’t over bake your macaroni. Leftover macaroni and cheese does tend to be a little bit thick, I usually add in a little bit of milk/cream when reheating and gently stir a couple of times. I’d recommend reheating over medium heat. I am going to make this for my daughters birthday party in a large buffet tray. Have you ever doubled this recipe? Any special modifications you would consider? I have successfully doubled this recipe. If you are cooking in two 9×13 pans the recipe should remain the same (you’ll likely bake it to the longer end of the time). I think this is a really good Mack and cheese. Think I will try it. Recipe looks great, but like nearly all recipes that tell you to “put in oven x minutes” it doesn’t specify whether to cover or not. So which do you do? Thank you Rod! I bake this uncovered. I’m so glad your kids loved this… and woah 10 CHEESES!! That sounds awesome! What is the light cream? Light cream is usually about 10-12% fat. (Such as a half and half). 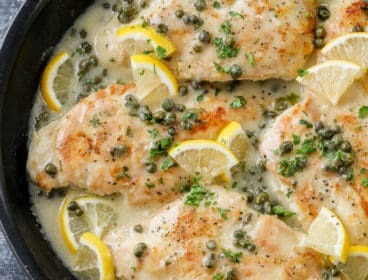 Can this be made ahead of time and put in the oven prior to serving? This is how my grandmother taught me and so i have always made mine like this but i also add an egg to my cheese sauce and a 12 oz pack of mozzarella cheese. Oh so Good! That sounds fantastic! I bet the egg makes the sauce even richer! Yum! I would like to receive your recipes. But don’t have any money to buy in to any thing. You can get a FREE weekly newsletter by visiting this link and simply leaving your email! No hidden costs, just a lot of yum sent to your inbox once a week! This was quite good. Next time I will cut back on the onion powder, as I thought it was a bit overpowering. My daughter and I followed this recipe step by step and it turned out as good as it looks in the picture. After baking 20 mins in the oven the texture turned out perfectly…nice and creamy. This recipe is definitely a keeper! Thanks Holly for sharing! This is big how does it reheat? Really well. I sometimes add a little milk if needed when reheating to keep it creamy! this was awesome reheats really well. 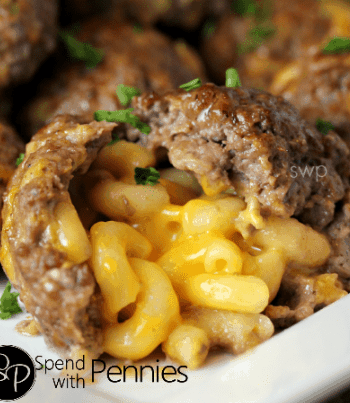 This recipe is printed and is in my favorites binder….so good! Can I use something else besides the light cream? You could substitute evaporated milk. Would it be ok with out the light cream? While I’ve only made this as written, you could substitute the light cream with milk or evaporated milk and it would likely be great. It may not be quite as rich but still yummy! Can you prepare this recipe ahead of time, refrigerate it, then bake it prior to serving? I am planning to make it for my kids birthday and wondering if I could make it the morning of other than cooking it during the party. Yes you can. I would suggest taking it out of the fridge at least 30 minutes before baking. Have you tried making this recipe on a grander scale? I need to make this for 100 people and this looked like just the recipe to try!! I have tripled this recipe before. It worked perfectly however the cook time is slightly longer and you may need to stir the casserole part way through cooking and then top with just for the last half. I made this recipe. Adding little bit of spicy jack cheese. I also grilled chicken on the bbq and diced it added to the mix, some left over bacon I diced up added as well. Your additions sound yummy to make this recipe into a complete meal! Hi, can I double this recipe without messing it up? Also what changes would I make to the cook time? Silly question, but I can mess up any good recipe!! Great question! Yes, you can easily double this recipe. It make take about 10-15 minutes extra cooking time, you just want to make sure the center is nice and hot and the cheese is melted and bubbly. Im so excited to try this recipe! I even copied the link to my homepage on my phone! :D I would have never thought to use the soup in it but it makes sense that it would help make it creamier! Mac and cheese is one of the few foods my 2 1/2 yr old will eat so I’m sure she will love it! I’m with you Shelly, I could eat mac and cheese for every meal! I hope you love this one just as much as I do! This dish was so creamy and cheesy. It took a lot of cheese but it was worth it. Never heard of putting flour inn he Mac and cheese. Looking forward to trying, sounds delicious!! Can this be made the night before and baked the next day? Yes, it can be made the night before. I’d recommend leaving on the counter for a little bit before baking and you may need to adjust the baking time by a few minutes if it’s cold. Is the 12 oz dry macaroni by weight or volume ? Do you cook you soup first with can milk? Or just add it from the can? You just add it straight from the can. 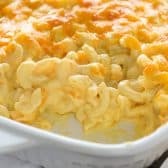 I am going to make macaroni and cheese recipe today my granddaughter loves it and I am sure she will love this better . I hope your family enjoyed this recipe as much as my family did! Looks so yummy! Going to make it for the kids later this week! Just wondering if the four cups of cheese is 4 shredded cups? Or do you just use block cheese and measure it out that way? Thanks! Can you make the night before and put in the fridge until ready to bake? Yes, I’ve made this recipe ahead of time. I’d suggest you ensure your pasta is very al dente. Awesome thanks a lot!! I am a huge fan of anything yummy I can make ahead of time for a gathering. What does the dry mustard do? I’ve seen this in other Mac and cheese recipes. I don’t usually buy dirty mustard but was curious what it does. I’m no longer using anything else! I thank YOU SOOOO MUCH! This is the best macaroni ive ever had and it will be a family staple for years to come! Enjoying all the recipes. You place a different way of making the most of each recipe. Thank you Ann! I too love to see how other people put a spin on the recipes I make often! The soup is used condensed so it’s much thicker than the light cream. You will still need the cream in this recipe. Enjoy! How many people will this size dish feed?? Holly, if my grandson and granddaughter eat this, they will eat most of the 8 servings between them. HA They love mac and cheese and this sounds delicious!! They are coming to visit Memorial day, so I’m going to make this for them. :) Thanks! I never leave comments on recipes I try but I have to leave one here. This mac and cheese is so delicious and will now be my go-to recipe. Thank you so very much for sharing! <3 Thank you so much for taking the time to comment Candace! I'm glad you loved this, we love it too... definitely my personal favorite! Sounds soooooo good. Going to try, thank you. I made this tonight, and it was AWESOME! I was afraid of it being too saucy (therefore soupy), but it was actually the perfect consistency. I think the key is really following the directions — don’t overcook the macaroni in the first step so it can still soak up some of the moisture when it bakes in the oven. Also, allowing it to rest for about 15 minutes after it comes out of the oven helps the sauce to thicken (don’t worry, it’s still plenty hot enough to eat!) I didn’t have any cream or milk on hand, so I used half-and-half for each (so 2.5 cups total). I did use the cheddar cheese soup, and I think that’s what helped keep the sauce so velvety. Some recipes I’ve tried before ended up with a clumpy sauce after it sits. Thanks for a great recipe! I’m so glad you loved it Natalie! How does this recipe keep? I want to make it a day ahead..
Holly, thanks! I’ve been looking for a mac and cheese recipe for my potluck tomorrow. I think yours is the winner. Have you ever added any meat or veggies to your recipe before? I was thinking about adding in some shredded chicken or bits of butternut squash with a little bit of sage to the recipe. I haven’t tried it but this one is very ‘saucy’ so I think it should work just fine. I made this and added a couple of cups of peas and crumpled bacon. Simple amazing. I love to add chopped cooked ham to my mac & cheese. This receipe is a dream! I’ve made it for thanksgiving and christmas. My mother who hardly eats anything I cook even loved it. I searched all over the internet for the perfect mac and cheese receipe. Decided to take a chance on this one. It’s so creamy and even better the next day! Can you make this recipe ahead of time and then freeze for the holiday or is it better to eat fresh? If so, please post instructions. Thanks in advance. This one is definitely best made fresh. Hi there, can I make this a day before and then bake before serving? Yes, that should work just fine. I would ensure that your noodles are cooked al dente so they don’t get mushy. 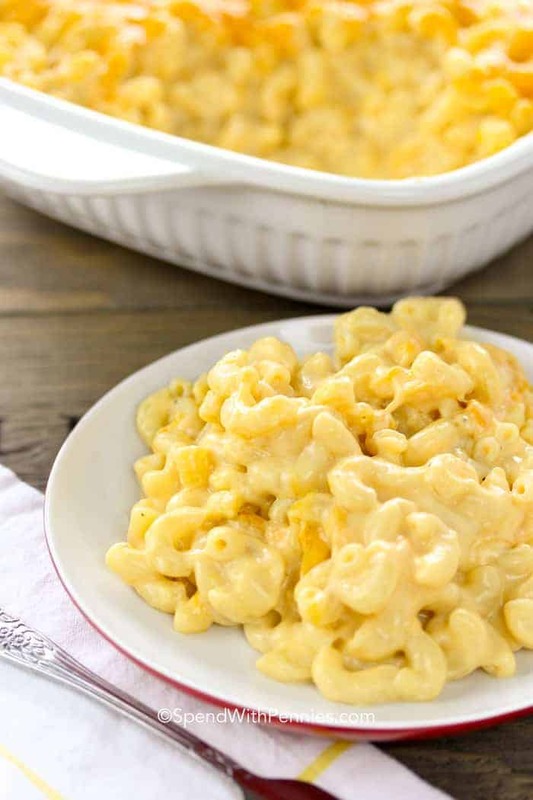 This is one of our favorite mac and cheese recipes! Since I have found it, I have made it four times! Will be making it for our family Christmas dinner! It is probably the best mac and cheese I have had, so creamy and such a comfort food! YUMMY! I’m so glad you loved it Brenda! Merry Christmas to you and your family! Wonderful news, as this is what I am planning to do with OUR Christmas dinner this year, to go along with a ham! I want to make this for Christmas. I have regular cheddar cheese soup that asks for a can of milk to be mixed with it. Will that work ok? I can’t find cream of cheddar, just cheddar cheese soup. Is it the same? Do I add the can of milk with it? It is the same (I use this can here). I do not add the milk, just the condensed soup. I’m confused. If I am using soup I should not add the milk? You do not need to add the milk to the can of soup. I just made this and it’s great! I made one small change in reserving a little of the Parmesan cheese to put on top with the rest of the cheddar as well :). I made this as a first timer in the macaroni field, and I’m a rookie in the kitchen. I do not know how to measure a cup of cheese. I figured a pints a pound the world around, so I just used 8 oz of cheese per cup and whoa too much! Help me out here, are you talking shredded cheese? By the way, I received many compliments on my attempt. Thanks. A cup of cheese would be about 4oz. You are correct in that 1 cup is 8 fl. oz (for liquid) which is a volume measure. Weight measures are not always the same. Hope that helps! Holy catfish! How did I not know this?! Thank you so much for pointing this out! I plan to try this recipe this week. My family loves velveeta in their mac and cheese, but ‘m a fan of real cheese. Can’t wait – it looks so delicious! A kitchen scale is invaluable!!! Only like $9.99 on Amazon too! Million times easier to measure things correctly like loose stuff such as shredded cheese! I am still confused about the measurement of the cheese. Are you seeing instead of 1-8 oz. cup, use 1/2 C to equal 1 cup of volume? I only have regular measuring cups. You will use 4 cups of cheese per the ingredients in the recipe. One 8 oz package of block cheese yields 2 cups shredded so you will only want to use 1/2 block for one cup. Next time I make it. ..and it will be soon. ..I feel either 16oz of noodles or perhaps even some cauliflower would be appropriate. It seemed there was plenty of sauce to accommodate more. I may even go crazy and experiment with other “cream of” soups. Yeah. …I know. ..but I live dangerously. LOL… gettin’ crazy in the kitchen! :) I really love the idea of adding some cauliflower! I’d love to hear how your escapades turn out! My mom uses cream of mushroom and it’s really good also. I personally don’t add it to mine but if you want to use soup it’s a good alternative. I have everything but the mustard powder. Do you think this is a huge part of the recipe or will it be fine without?? You can leave the mustard powder out. I forgot the onion powder Is that ok? Yes, it will still be great. Onion powder just adds extra flavor. when i dont have mustard powder, i take a half and half mix of grainy and yellow mustard…adds a little kick to the mac and cheese. Do you think that after the casserole is out of the oven can you put in crock pot to keep warm until served? I haven’t tried it but I think as long as your slow cooker isn’t too warm it would be ok. I do have a crock pot Mac & Cheese that I’ve left on warm before. If left too long the cheese can dry out and if too hot the cheese can separate. I hope that helps. This looks delicious and we plan on making it! Question though: could you prep the noodles and cheese mixture at night and then throw it in the oven in the morning or do you have to do it all at once? I think that would work. I would suggest making sure it is well covered to ensure it doesn’t dry out. i think evaporated milk would work well in place of light cream…dont you think? We like using whole wheat noodles. Do you think they will affect the taste? I think it would still be delicious with whole wheat noodles. This is the absolute best Mac n cheese I have ever had. The leftovers are just as good! I will never look for another recipe again! The cream of cheddar is what makes it! Just wondering if this could be frozen? I just bought regular whipping cream since they didn’t have light. Will that be OK? Also, when the recipe calls for milk can I use skim milk? Thank you in advance. I plan on making this tonight. I think if you’re using heavier cream and lighter milk, it should work out just fine. I made this last night and loved it! 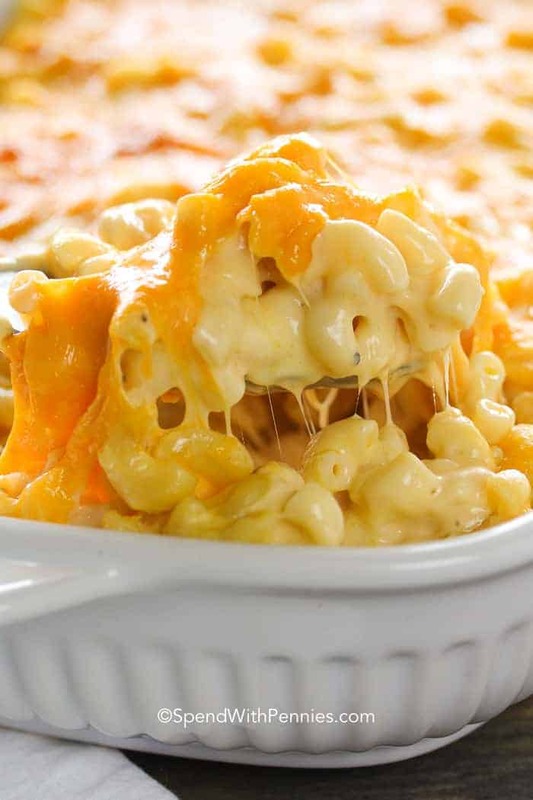 I am always on the lookout for a good mac and cheese recipe and this one fit the bill…definitely a keeper. I used the soup and fyi, since the pasta came in a 16oz package I used all 16oz instead of just 12oz and there was plenty of sauce. And I do love a lot of cheesy sauce. Yummy! I’m so glad you enjoyed it Denise! Did you use the cheddar soup since you made it with 16oz of pasta? This was so good! My seven year old had seconds. It’s just the two of us so I put it in two small casserole dishes and put one in the freezer for next week. How did it turn out after you froze it? Below the second photo, you will see a pink bar with the recipe title on it. On the right hand side there is a “print recipe” button. It will print on a single page. I have to make this gluten free so I will buy gluten free macaroni and use corn starch instead of flour. I know this will be delicious. Bisquick makes a gluten free flour, could I use that instead of corn starch. If the corn starch would work how much should I put in to thicken the sauce? Thanks for your help. I cook gluten free, and what I use is a good all-purpose gluten free flour that does not have xanthan gum in it. I do this for gravies also because corn starch breaks down if the dish is not all eaten right away. This recipe is just great without the soup. You can leave it out! Should I use fresh “grated” parmesan or fresh “shredded” parmesan? OMG this recipe was so easy to follow!!! Kids and hubby loved it and went back for seconds!! Will become a regular at our place!!! So glad your family loved it Bernie! Thank you for leaving off the bread crumbs. Ever since I was a little kid, I’ve hated crumb toppings on mac-n-cheese. I know a lot of people like it, but it’s nice to see photos without it. I would also leave out the soup. Plenty of goodness in the cheese sauce you make. I’ll bet the soup really adds a special taste. I have a friend who stirs crushed soda crackers throughout the mac and cheese. I have always liked it, and it was such a different addition. I prefer not to use canned soups. Hopefully, leaving it out will not take away from the final result. You need the soup. I made it without and it wasn’t the same as when my friend made it for thanksgiving. It was more dry than it should have been and I don’t like using canned soups either, but from now on I will use the soup in this! You could use a can of condensed cheddar cheese. Sams club sells Rico condensed cheddar cheese and in the ethnic dept of supermarkets you can find smaller cans of it. When you say light cream, does that mean whipping cream?? I lack in the cooking dept! Light cream is usually around 10-12% sometimes known as half and half. I was wondering the same thing. Thanks for your reply! I didn’t know what that meant so I bought whopping cream. I could find “lite” so I bought heavy and now all the stores are closed for Christmas, yikes! Wonder if canned cream will work instead? I would suggest half heavy cream and half milk. It should work perfectly. Great recipe, thanks for sharing!! The cream of cheddar soup gives it the perfect creamy consistency! Sooooo good!! 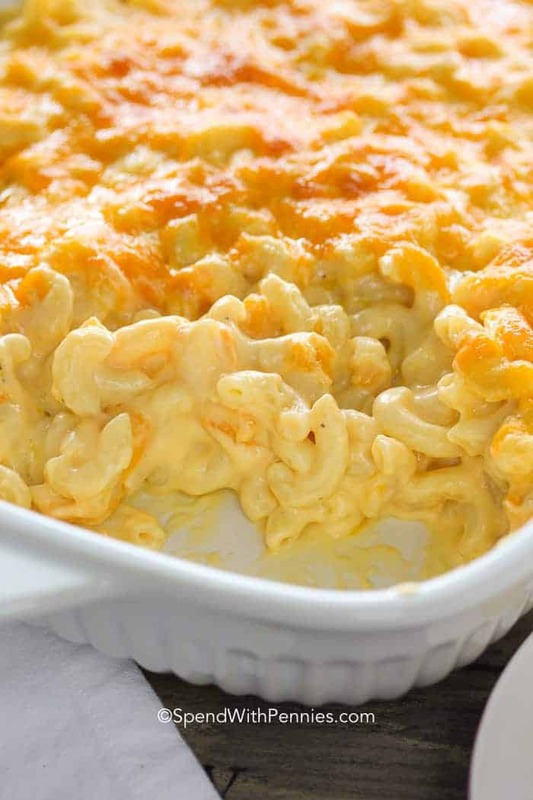 This is an amazing Mac and Cheese recipe. We made it last night and loved it!! 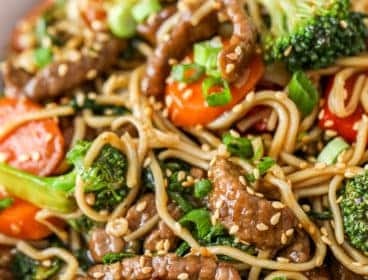 This is now my go to recipe and so quick to make! This mac and cheese looks luscious and creamy. The cream of cheddar soup is such a great addition and provides that extra creaminess and richness. I like the way you think Kristina! That sounds really great! I add bacon to my Mac & Cheese quite often, it is REALLY good. I do add a small amount of the grease from cooking the bacon too, it increases the bacon flavor, you just have to be sure to mix it in well. If you try it you’ll be surprised at how it adds that extra special flavor to Mac & Cheese. Yummy idea, thank you for sharing! Bacon just seems to make everything a little bit better. …or tuna ….or chicken….. just sayin’…. When I make tuna and noodle casserole, I always crush WISE Potato Chips and sprinkle on top of the casserole. I don’t know what it is about the WISE Potato Chips; but they add a nice salty flavor to the tuna and noodle casserole. Even my picky daughter-in-laws like it. Can this recipe be made a day ahead and still be as delicious? Thinking of making this the day before thanksgiving just to cut down on things we have to make the day of! Hi Kacey!! How did it turn out a day later? How much longer did you cook it for?